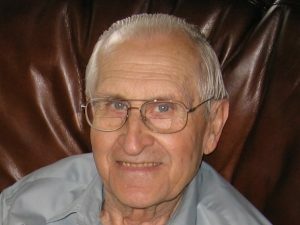 Loran L. Votruba, 92, of Norfolk, formerly of Schuyler, died Sunday, July 29, 2018, at the Norfolk Veterans Home in Norfolk. Thursday, August 2, 2018 10:30 a.m.
Visitation Wednesday, 5:00 p.m. to 7:00 p.m.
Loran Leo Votruba was born to Frank O and Lizzie Votruba on a farm in Dodge County Nebraska February 20, 1926. Growing up Loran lived on a farm by Dodge and attended school in Dodge, NE. At age 17 he joined the Army 3461st Ordinance Medium Automotive Maintenance Company. Loran served during WWII from February 21, 1945 to November 26, 1946. He was part of the first occupying force in Japan. Upon returning from the service he started farming by Dodge, NE. Loran and Wilma farmed by Dodge, NE from 1948 to 1949. In 1950 they moved to a farm south of Clarkson, NE. They worked this farm until they had a farm sale in 1995. In 2000 they moved from the farm to Fremont, NE. In 2014 Loran and Wilma moved to Homestead Assisted Living in Norfolk, NE. In 2017 they moved to St Joseph’s Rehabilitation and Care Center in Norfolk, NE. Late in 2017 they relocated to Countryside Home in Madison, NE. Loran is a member of St Mary Sacred Heart Catholic Church in Norfolk, NE. Prior to this he was a member of St Mary’s Catholic Church in Schuyler, NE and St Patrick’s Catholic Church in Fremont, NE. Loran is a life time member of the Veterans of Foreign Wars. Grandchildren Lance (Amanda) Votruba Gretna, Trevor (Shelley) Votruba Gretna, Katie Votruba Plano, TX, Holly (Matt) French Palm Harbor Florida.